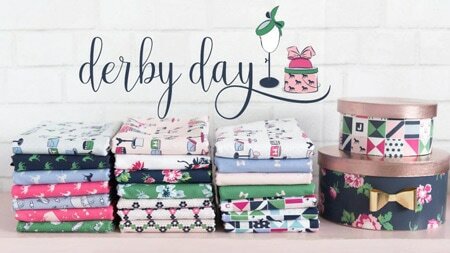 I’ve had a fun time the last few months sewing up some samples from my new fabric line Derby Style. 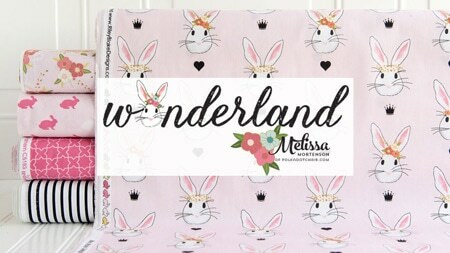 While I still have a lot more ideas than time when it comes to sewing with this new line, I have been able to get a few things done that I’m really excited about. 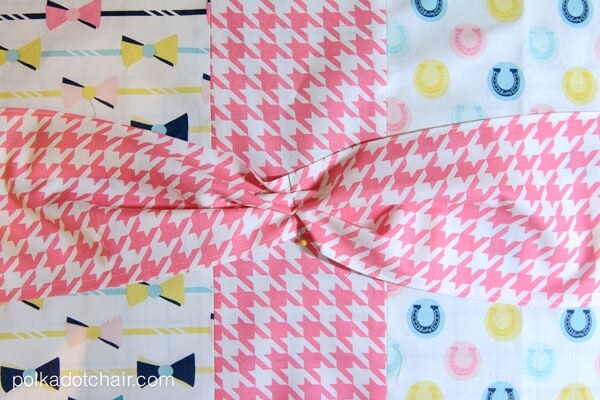 Today I’m going to share with you how to make the pillow with the large bow (the one with the pink houndstooth fabric). 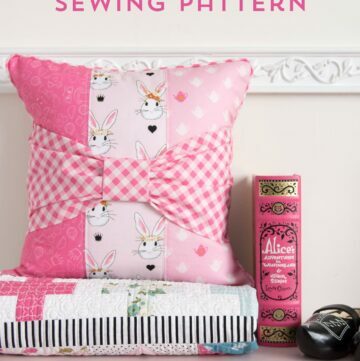 It sews up quickly and you can make a bunch if you want! 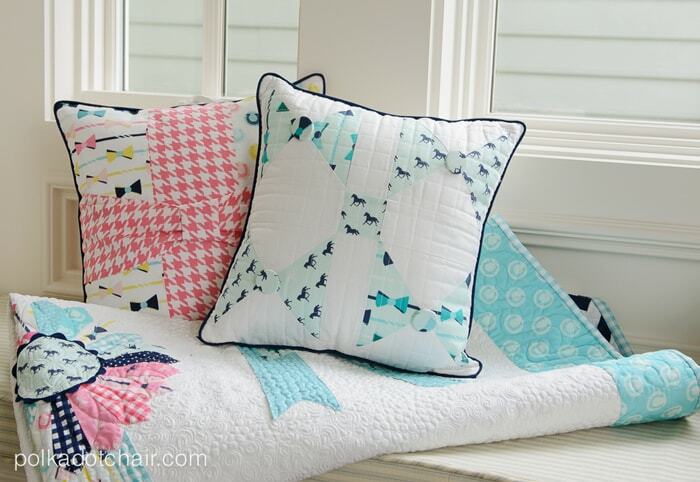 (the tutorial for the blue pillow was shared on Riley Blake Designs blog last week, watch for it to repost here soon). 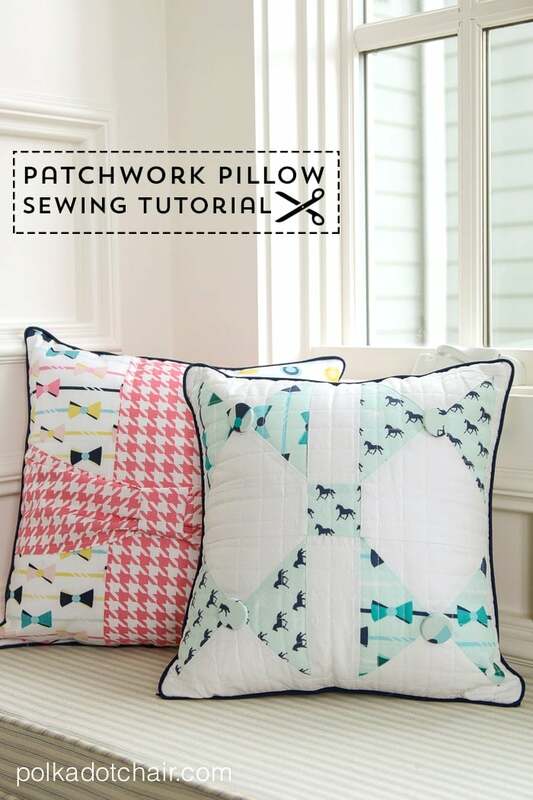 Begin by sewing the 3 16″ strips together with 1/4″ seam allowance, the houndstooth print in the center. Press seams open. 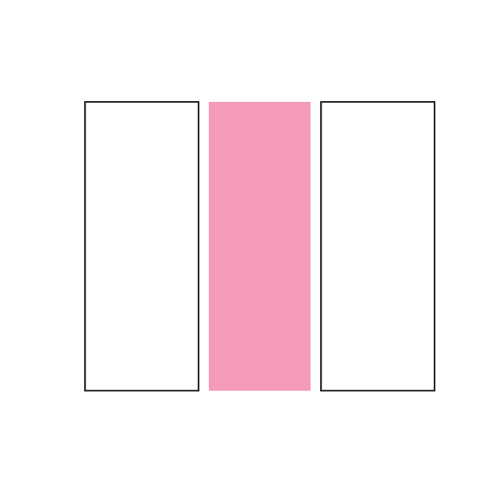 On the 5 1/2″ x 18″ piece of fabric turn under the raw edges on the 18″ sides 1/4″ and hem. Press. 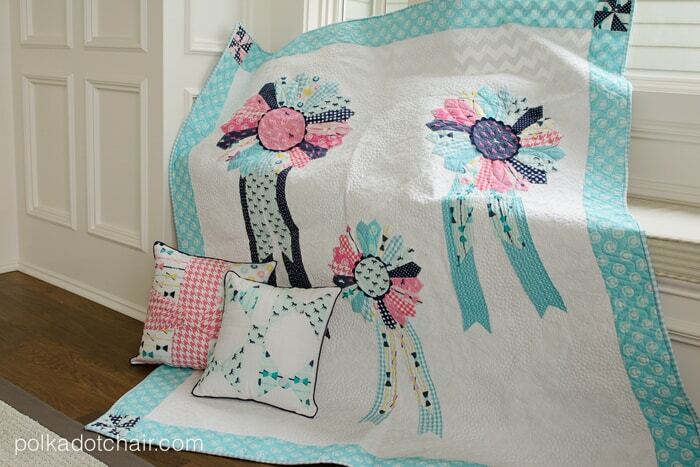 Pin the bow to the pillow front and gather up the center a bit and place a pin. 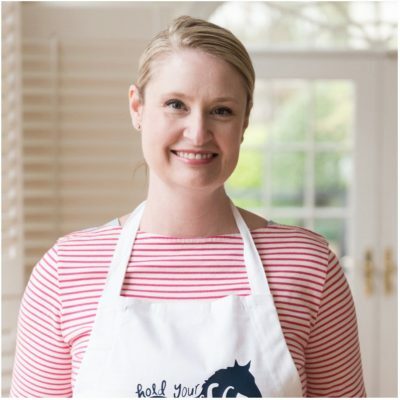 When you get the bow the way you like it pin it to the edges of the pillow and baste in place. 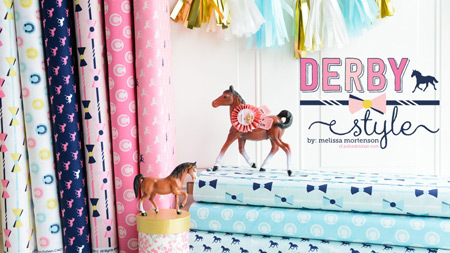 Trim off any excess bow fabric. (Don’t remove the pin). 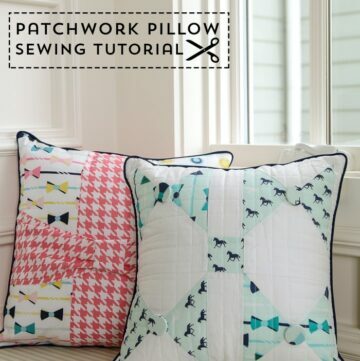 Attach piping to the outside of the pillow front, if you need help with this use this tutorial. Sew the pillow front to the pillow back leaving an opening in the bottom to turn the pillowcase right side out. 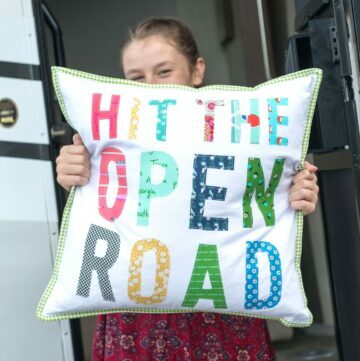 Insert pillow from and hand stitch closed. To make the knot for the bow. 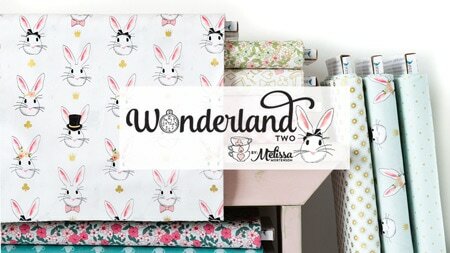 Take the 6″ x 6″ piece of fabric and fold it in half and stitch with 1/4″ seam allowance. Turn right side out and press with the seam in the center. Fold piece over the center bow and position as you like. Hand stitch in place. 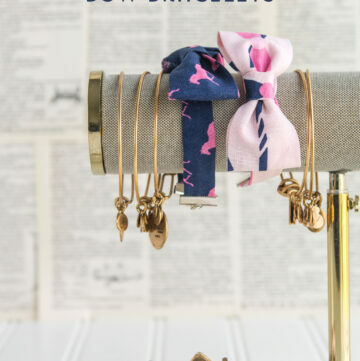 Watch for Derby Style to hit stores in January!! The pictures are lovely, thank you for the tutorial. Wishing you and your family a wonderful, warm and ‘gezellige’ 🙂 Christmas! Enjoy! !